Tom Haak op HRtrendinstitute.com, december 2016. 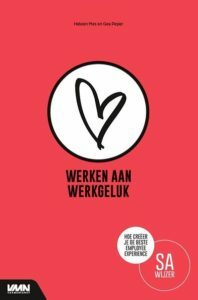 4 trends in het meten van de bevlogenheid en stemming van medewerkers, zoals een hogere frequentie en vragen per mobiel, en waar je daarvoor moet zijn. 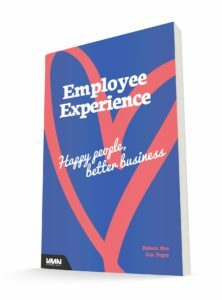 Both at Philips Electronics and at KMPG, where I worked at the end of last century, I was involved in the design and implementation of the employee engagement measurement process. These were the days of the big surveys. With the help of a prominent provider (ISR) we designed the survey, with certainly more than 100 survey questions (90% standard, 10% tailored). The wording of the questions was adapted to the vocabulary of the organisation. Many sessions were spend on getting buy in from management. The launch was postponed several times (“This is not the right moment for a survey”). Finally the questionnaires were mailed to all the employees worldwide, and around 60% took the time to answer. Although many big organisations still conduct (bi-)annual big surveys, over the past years some trends have emerged. Many organisations find feedback once per two years not frequent enough. The trend is to survey more frequent. If you survey more frequent, you want shorter surveys, as you do not want to bother the employees with lengthy questionnaires. Frequent surveys with a limited set of questions are generally called pulse surveys. Gallup is a good example of a provider of a simple pulse survey. 12 standard questions that give a good indication of employee engagement. Although you can get a good indication of the level engagement by a short pulse survey, it is less possible to get a good insight in the drivers of engagement. What you see some organisations do is combining regular (monthly/quarterly) pulse surveys with more extensive annual or bi-annual extensive surveys. In the traditional process the engagement survey was very much a event. the survey became an HR-intervention. The expectations were high: finally we as employees can express our opinion, and we expect that senior management will take action. Often these high expectations were not met. With more frequent and less extensive surveys (see 1.) the survey has become less of an event. It is considered normal that the organisational temperature is measured regularly, to check if the organisation and the people in the organisation are moving in the right direction. Most current mood measurement methods are still based on employees having to answer questions. Ease of use has increased. Mobile is becoming the standard. but still the employee has to answer one or more questions. More passive mood measurement methods are emerging. With current technology it is possible to analyse texts on emotions (e.g. with Tone Analyzer). The e-mails of employees and the messages on internal social media like Yammer can be used as input and analysed with these advanced text analysers. A provider as Keencorp is providing this. Of course there are privacy and ethical issues. If you treat the data in a trustworthy and ethical way (e.g. no reports on individual level) these might be dealt with. The benefits for employees are also clear: they can provide input for fast feedback, without any active involvement. Recognising emotions in facial expressions is also possible. 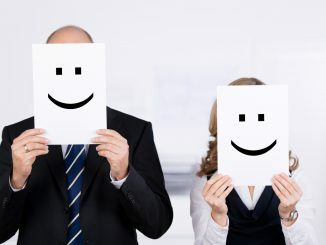 The providers in this area, as Affectiva, Imotions and nVisio still mainly operate in the marketing domain, but undoubtedly employee mood measurement can be a next opportunity. Most extensive employee surveys have one or more ‘open’ questions. Like: “Do you have other suggestions that can help our organisation to improve client satisfaction or employee engagement?”. In the past you would have to read all the answers and find a way to categorise and summarise. Today software can do this and a lot better than you were able to do it. Making sense of the answers of open questions and drawing intelligent conclusions is made possible by many of the employee mood management providers (Workometry is a good example). 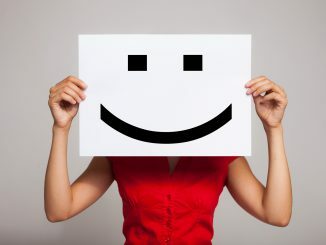 Connecting mood measurement results with other important measures (client, financial) is also one of the focus points of the current people analytics teams. 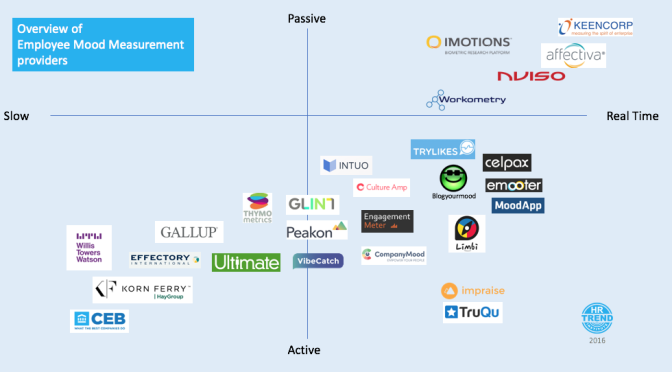 We tried to make an overview of current providers of Employee Mood Measurement. There are many, and we realise our overview is not complete. The providers are mapped very subjectively in the graph below. We used two dimensions: Active-Passive, and Slow-Realtime. Most providers require an active involvement of the employee (answering one or more questions). Most providers are moving to the right on the axis Slow-Realtime. Many providers use the word realtime, but this is more related to data-analysis and reporting than to data-acquisition. The overview does not give any information about the quality of the providers, as our research was not extensive enough to make any judgement about this aspect. It is also not our intention to communicate that realtime and passive is better than slow and active. There are very good traditional survey methods that give you high quality actionable information. The 27 providers mentioned in the overview can roughly be divided in five different categories. There are the ‘traditional solid’ survey providers (as CEB,Effectory, Korn Ferry Hay, Willis Towers Watson and Gallup). We also see a new group of modern employee mood measurent providers, often offering a platform where the different elements (surveying, analysis, reporting) are integrated (Company Mood, Culture Amp, Engagement Meter, Glint, Intuo, Peakon, Thymometrics, Vibecatch). A third group provides really simple feedback tools, often based on one question, asked at the end of a workday (Blogyourmood, Emooter, Limbi, MoodApp, Smiley, TryLikes). 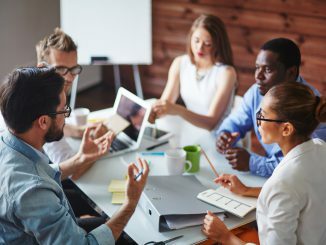 Impraise and TruQu are a separate sub-category: these solutions are mainly designed for employees to gather individual performance feedback and developmental suggestions, but they can also be used to provide more consolidated employee insights.